Today, the answer to these devastating floods would be to elevate or relocate an existing home out of the flood’s fury. Any future development would be restricted by strict building codes requiring flood doors to allow water passage beneath an elevated home or to transfer the legal right to develop flood prone property to land more suitable for higher density development, usually in a neighboring city. Accommodating inundation waters was not a solution for our predecessors, as farmers and landowners were looking to decrease the annual cleanup process from continued flood devastation. As a result beginning in 1926, a new group the Associated Improvement Club of South King County with its subgroup “The Need for Flood Control in our Valley” began to look for solutions to control the river. The Great Depression and World War II intervened and delayed significant progress on Green River flood solutions. However, by 1955, a location at the base of Eagle Gorge on the Green River and a congressional appropriation accelerated erection of the earthen dam now known as the Howard A. Hansen Dam, named after the man that worked tirelessly to ensure its completion. As construction commenced, the Green River gave one last punch in 1959 with a flood that cost upwards of $35 million in today’s dollars. By 1962, the Green River was officially tamed and what once was a water-logged, soggy, flood-prone farming valley looked highly desirable for urban/suburban, commercial (Southcenter Mall) and industrial (Boeing) development, since it was flat, dry, and easy to access. 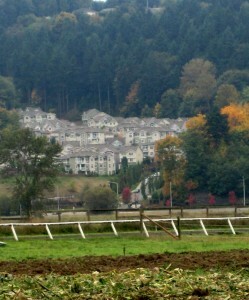 American Farmland Trust in its January 2012 publication entitled, Losing Ground: Farmland Protection in the Puget Sound Region states that King County lost 162 square miles of farmland between 1950 and 2007. 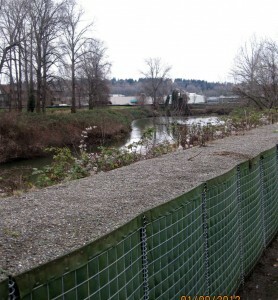 The lower Green River basin between Auburn and Tukwila, which corresponds to the acreage of the cities of Kirkland, Bellevue, and Redmond combined, is approximately 1/3 of those lost farmland acres. Fast forward to 2009, and an inspection of the Howard A. Hansen structure after a significant winter storm revealed seepage through the right river abutment and dam fragility. Local and state governments scrambled to reduce the risk of catastrophic failure, by reducing the water held behind the barrier, developing escape routes and warnings, and temporarily raising levees in the flat former farmlands to mitigate any impacts from a possible deluge. Concurrently, engineers worked fervently developing a solution for dam integrity. Why was it so compelling that the dam be fixed? What was at risk besides loss of life, limb and property (as if that was not enough), if the structure failed? Why do we work so hard to protect human built features from the potential ravishing destruction that nature or man’s failing could bring? Farm advocates were breathlessly watching to see if this was a rare opportunity to slowly bring the valley back to its agricultural roots. Crisis averted. As anticipated, an engineering solution was found and completed by the start of the 2011-2012 winter wet season to stabilize the abutment thereby substantially decreasing the odds of any major flood event in the valley. 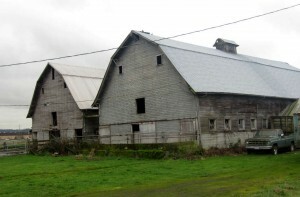 Will Kent Valley ever revert to its agricultural roots? Probably not. 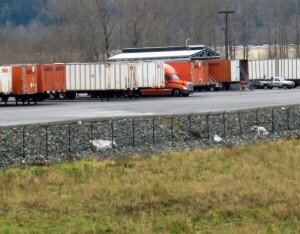 Will other western Washington valleys be able to maintain their agricultural economies? Maybe or maybe not. Some issues to ensure long-term agricultural production are out of our local control such as national food corporation policies, prices of products from international and domestic markets, and impacts from climate change. These issues we can influence but most likely cannot easily change. However, there are issues over which we have power to affect our local food economy. To effect that influence, it takes political will and a community dedicated to maintaining a vibrant agriculture economy, by farming food production lands, removing development rights from rural lands, maintaining farm animal veterinarians, feed stores, and other agricultural infrastructure, creating land use regulations kind to growing food, and developing solutions to adapt to climate and market change. We can have western Washington locally grown food provided we continue to work, advocate, and support it.